ike contented people Bouzeron has almost no history, but what little there is deserves our consideration", wrote Auguste Besset in 1912 in his book on Bouzeron. This little village is at the very top of the Côte Chalonnaise, bordering on Santenay and the Côte de Beaune, only eight kilometres away from Chassagne-Montrachet. In terms of size not much has happened here since the late 18th century. In his "Description du Duché de Bourgogne", published in 1760, abbé Claude Courtépée counted 155 inhabitants in Bouzeron. There was an increase in population during the late 19th/early 20th century, but today the figure is back down at 154. But Bouzeron is unique. It is one of a kind in the French world of appellations. 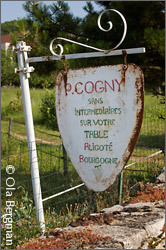 This is the only village appellation exclusively for the aligoté grape. The regional appellation of Bourgogne Aligoté covers 299 communes throughout three of Burgundy's four departements; Yonne, Côte d'Or and Saône-et-Loire. The Bouzeron appellation is only a fraction of that. While the vines for Bourgogne Aligoté cover around 1575 hectares the Bouzeron vignoble – spread out across the communes of Bouzeron and Chassey le Camp – is only 44 hectares. – It was very important for the village when we got the village appellation, says Anne-Sophie Chanzy at Domaine Chanzy in Bouzeron. It meant a lot for the marketing of the wine. From a publicity point of view it was very good for both the wine and the winegrowers in Bouzeron. Now we have a lot of people that come to Bouzeron to taste and discover the wine. - I supported the creation of this appellation, but the aligoté has been there for a very long time. I like the Bouzeron a lot. It's different. It is a beautiful aligoté. We produce about 5000 bottles a year. It's easier to sell Bouzeron than Maranges, says Pascal Borgeot at Domaine Borgeot in Remigny. 1997 was the first vintage for the village appellation Bouzeron. 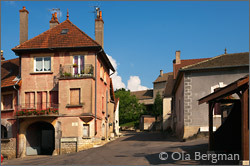 Before that, from 1979, the village had benefitted from a regional appellation – Bourgogne Aligoté Bouzeron. That was the result of the work started by Messieurs Chanzy, Chemorin and Cogny in 1974. – There are five winegrowers in Bouzeron and there are another three or four that have vines in Bouzeron but that are located in Rully or Mercurey, explains Anne-Sophie Chanzy. Elsewhere in Burgundy the aligoté grape has been pushed out from the slopes by the chardonnay and the pinot noir. Nowadays the aligoté is mostly grown down on the plain, in richer soil, giving higher yields. In Bouzeron the aligoté still has access to the slopes, with nutrient-poor, limestone-rich soil which controls the yields. Claude Courtépée singled out three of the lieux-dits in Bouzeron – La Fortune, La Provence and La Digoine. Most Bouzeron bottles today only have the village name on the label. In a few cases there is a mention of a specific lieu-dit – Domaine Borgeot - Bouzeron, Les Tournelles; Domaine Chanzy - Bouzeron, Clos de la Fortune and Domaine Jacqueson - Bouzeron, Les Cordères. 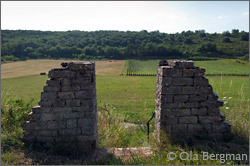 Domaine de Villaine owns vines in La Digoine, but since it is pinot noir the wine produced must be labelled as Bourgogne Côte Chalonnaise, La Digoine. There are no premier crus or grand crus in Bouzeron.